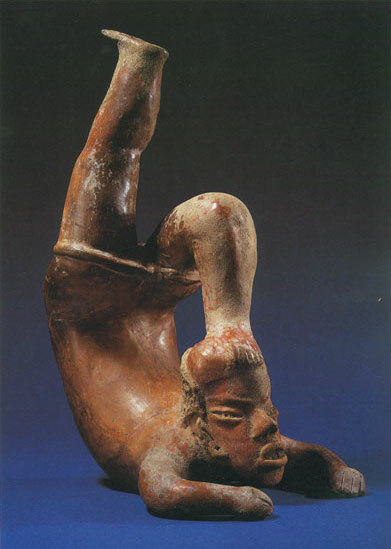 A Tlatilco redware sculptural vessel in the form of a contortionist. Mexico, Preclassic, circa 1250-900 B.C. Eight Major Museum Catalogues across Europe, 1959-60, including Tresors d'Art Precolombien, Paris, 1959. Coe, Michael D., The Jaguar's Children: Preclassic Central Mexico, The Museum of Primitive Art, New York, 1965. Von Winning, Hasso, & Stendahl, Pre-Columbian Art of Mexico and Central America, Abrams, New York, 1968. The Art Museum, Princeton University, The Olmec World: Ritual and Rulership, Princeton, NJ, 1995.